Anthony Bracewell appeared on Show 180, recorded in May 2008, at age 16. 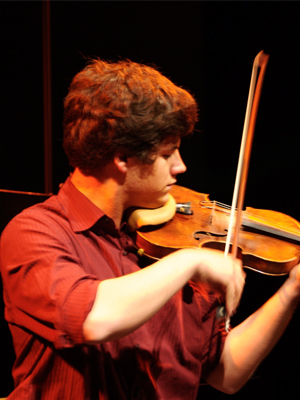 Anthony Bracewell (violin), 16, is a From the Top $10,000 Jack Kent Cooke Young Artist from Essex, Ontario in Canada. He is co-concertmaster of the Detroit Symphony Civic Orchestra and has attended summer programs at Meadowmount School of Music in New York. Anthony also performs with his chamber ensemble, the Viaggio String Quartet. A junior at Walkerville Collegiate High School, he is active in drama and music and has received honors for writing original compositions for school productions. Anthony is a Jack Kent Cooke Young Artist.